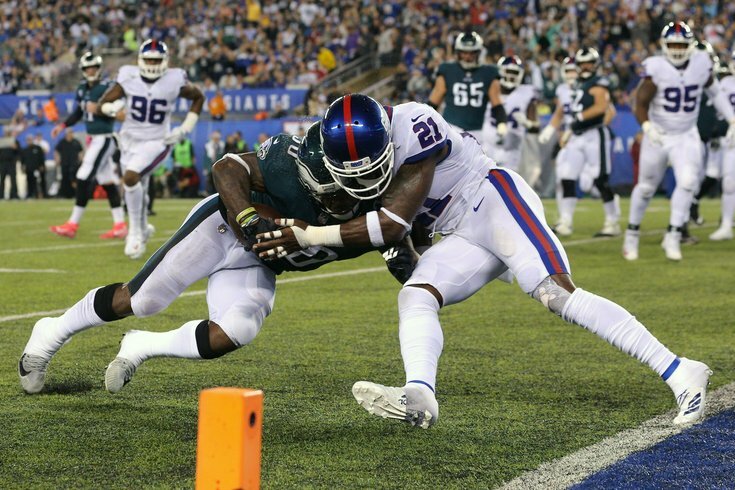 Philadelphia Eagles running back Corey Clement is hit by New York Giants safety Landon Collins. A few weeks ago, this would probably have looked like a slam-dunk victory for the Eagles. But with the Giants having won two straight — and the Birds having dropped two straight since their bye week — the outcome seems far less certain than it once did. We've broken down the injuries, pointed out the key matchups to watch and offered our own predictions for this one. Now, as we do every weekend, it's time to take a look around the nation to see how the various experts, both local and national, think Sunday's matchup is going to play out. • PhillyVoice staff: I guess we're gluttons for punishment because four out of five picked the Eagles to win, including sports editor Evan Macy. It's really tough to pick this game. I do believe the Eagles are the better team, and still do have a chance to make a run at an NFC East title but that is based on little more than optimism and faith. What I have seen recently is only technically football, and really just a collapse of epic proportions for a team many believed could even repeat in 2018. The Birds' secondary against Odell Beckham Jr. and the Giants other offensive weapons is my biggest concern, as is avoiding another Saquan Barkley explosion. I am taking the Eagles, because I think the pass rush and a Carson Wentz bounceback from his worst NFL game ever are in the team's favor. But if I am wrong, I am officially done picking them for the year. • ESPN staff: Eight of their 10 national experts are picking the Eagles to beat the Giants. Injuries have hit the secondary so hard, it's barely recognizable. There's a plausible scenario in which the corners are Chandon Sullivan, De'Vante Bausby and Cre'von LeBlanc. Of that group, only LeBlanc has started a game in the NFL. The offense has failed to score in the first quarter in eight of 10 games. The Giants will have the opportunity to unleash Odell Beckham Jr. early and ride Saquon Barkley the rest of the way. The Eagles have owned this rivalry of late, winning eight of the past nine and waxing the Giants earlier this season. But they're stumbling entering this one, having given up 75 points in their past two games. That should allow the Giants to score some, keep it close and cover the spread. But it won't be enough. Philadelphia can rush the passer (26 sacks), while the Giants have allowed an NFL-high 36 sacks. That will be the difference. Can the Giants make it three in a row? No. As badly as Philly was trounced in New Orleans, this group should rebound at home against its longtime rival. Recall also that New York won its previous two games over the 49ers and Bucs, who are a combined 5-15. Philadelphia does have major work to do to win, however. First, the Eagles must develop consistency on the ground -- somehow -- to prevent Carson Wentz from pressing like he has the last two weeks. Mixing blitzes and coverages will be paramount, because Philadelphia's secondary is not good enough to play straight zone and win right now. Eli Manning comes into the NFC East matchup having just balled out in Week 11, following a strong performance in Week 10. This could be another Giants-Eagles slugaroo. • OddsShark: Now here's a prediction Eagles fans will like, as they're picking the Birds to win by more than 17 points. The Giants have won two in a row, against a pair of cupcakes. The Eagles aren’t quite at that level, but they’re getting close. At this point the Eagles are probably out of the playoff race, and the Giants are definitely out of the playoff race, so there’s nothing on the line but pride. In this old-school NFC East matchup pride should be enough to produce what I’m expecting to be a fairly entertaining game that the Eagles manage to win in the end. There's a yo-yo element to this league. You're rarely as bad as your last really bad game, and you're rarely as good as your last really good one. Oftentimes, that makes it dangerous to get caught up in hot or cold streaks. The Philadelphia Eagles have been outscored 75-27 in back-to-back losses, the first of which came at home after their bye week and the second of which was an embarrassing blowout in New Orleans. The New York Giants have scored a combined 65 points in back-to-back wins with a plus-six turnover margin in that span. Injuries are a real factor. The Eagles defense is a mess with Hicks, Sidney Jones, Rasul Douglas, Jalen Mills and Avonte Maddox all hurt and Ronald Darby, Rodney McLeod and Derek Barnett already out. That unit might have a lot of trouble containing an offense that hasn't been consistent but is finding a groove with Saquon Barkley, Odell Beckham Jr. and Evan Engram. This should be a close game, especially if the Giants realize they have a chance to storm back and win the NFC East. • SBNation staff: Five of their seven experts are taking the Birds to win. • Philly.com staff: I've somehow been over my monthly article limit for the past six weeks — I know, it doesn't make any sense to me either — but you can get their Eagles-Saints predictions right here. • Bleeding Green Nation staff: Six of their seven writers are picking the Eagles to get back on track at home. • NJ.com staff: Three of their six football writers are picking the Eagles. Eagles beat writer Zack Rosenblatt is not one of them. The Eagles are reeling, some personalities in the locker room seem to be at odds, there's been mixed messaging with the coaching staff and they might be without their top four active cornerbacks against the Giants due to injury. The Eagles season could go on a true tumble if they fall to the Giants on Sunday, but they've given little reason to believe they can pull it off. • Philly Influencer staff: Four of their seven writers are picking the Giants to beat the Eagles, including Sean Brace. This truly is do or die, and to be honest, after these past two weeks I’m pretty beat. Both Dallas and New Orleans dominated and really showed this Eagles team needs to get to the off-season to reboot. It pains me to say this, but I think the Giants roll on Sunday. Saquon Barkley should get over 100 yards in the first half and Eli will find someone open. It’s getting late for the Eagles; that loss to the Cowboys brought the Philly back out in Philly’s fans. If they can incorporate Golden Tate better this week and the rest of the season, it can still be saved. The Saints could still hit a wall before season's end, but the odds of it happening at home, and against a team that’s struggling to make things click the way they did last year, are slim. The Giants, 3-7, have gotten the job done of late with plenty of Saquon Barkley and Odell Beckham Jr. while Eli Manning has played well enough to keep his job. The Eagles, 4-6, are trending toward New York’s level even though the Eagles beat the Giants in their first meeting this season (their last win). Philadelphia’s defense will keep struggling, but the offense will bail it out at home.